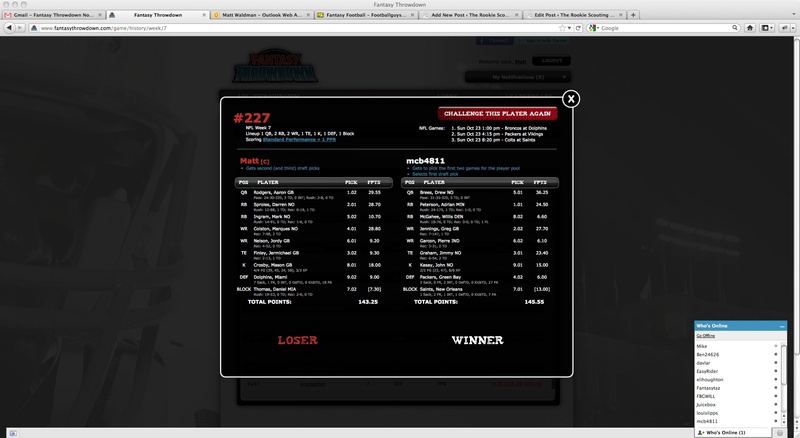 I might be a loser at Fantasy Throwdown this week, but this site is a winner. Click image for close up of the agony of my defeat. I don’t know about you, but my favorite part of fantasy football is the draft. 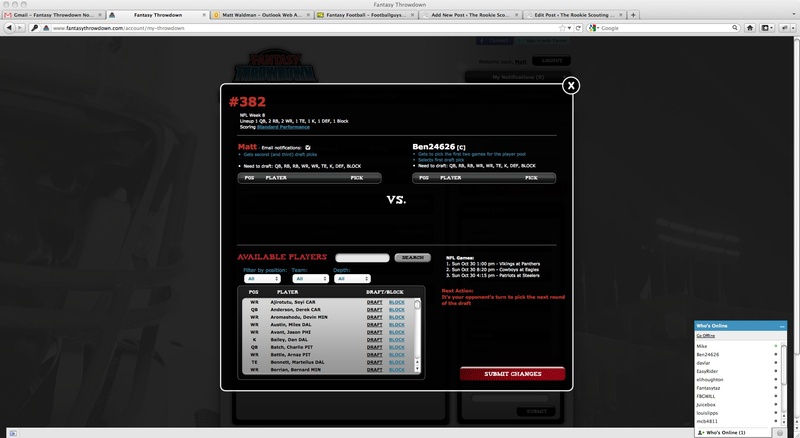 Now you can draft every day and have new match ups at any time at FantasyThrowdown.com . I actually received an email from reader last week who thanked me for tipping him to the site. He said it was like giving cookies to a sugar addict. We actually saw a lot of people try Fantasy Throwdown last week and the feedback was tremendous. If you didn’t try this strategic and addictive one-on-one fantasy football game last week, then you need need to challenge me to a draft. 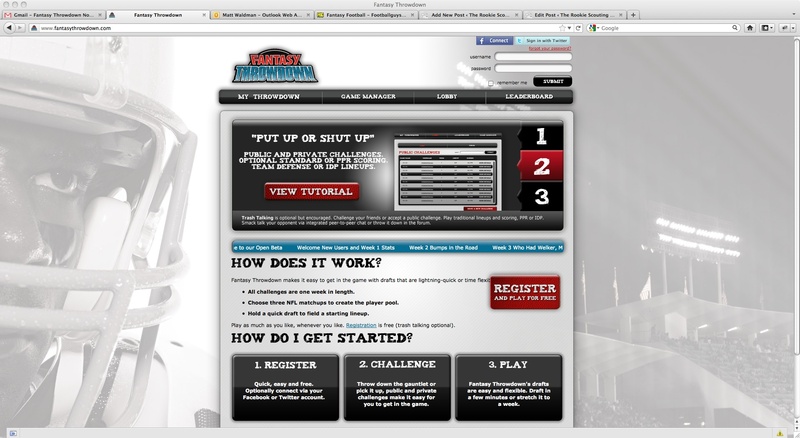 Just go the site, create a login, and enter my email (thegutcheck@gmail.com) when you create a private challenge. If you need a few more directions, see below. Starting a challenge is easy and the draft is really flexible. If you want to draft in minutes with a friend, you can do that online together. If you don’t have a lot of time in one sitting you can start a challenge on Monday and slowly pick a starting lineup before the first kick off on Sunday. Some folks are playing dozens of times per week and telling me drafts take as little as 10-15 minutes when both parties are online. Others tell me they enjoy knowing they can draft over the course of a week if they don’t have the time to finish a game in one sitting. Create a login and password by pressing the big red "Register" button. Click image to magnify. Once you’ve logged on, go to the “MyThrowdown” page. 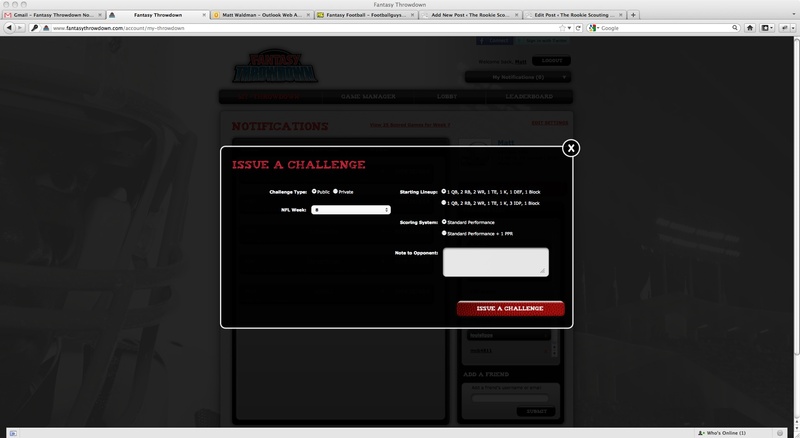 Click the red button to issue a challenge. As you begin playing, you'll also see the status of challenges you're in the progress of finishing as well as friends you make and their online status. Click image to magnify. There are two types of challenges. Public is open for anyone registered to accept and it posts in the lobby of the site. Private requires an email addres. Challenge me by entering thegutcheck@gmail.com as the address and I'll play you. When you make a challenge you also choose the week (you can challenge weeks ahead if you want), the lineup type (Team defense or IDP), and the scoring rules. You can even write a note to the person you’re challenging. Once you accept a challenge, you and your opponent choose the draft order and select the three games for the week to determine the players you’ll draft. Choose wisely, because your opponent can remove one player from the draft pool that you can’t use. Then draft either in a live draft room or slow draft with email notifications throughout the week. Just finish the draft before the 1pm (EST) kickoff for the week of that challenge. Here’s what a draft room looks like. 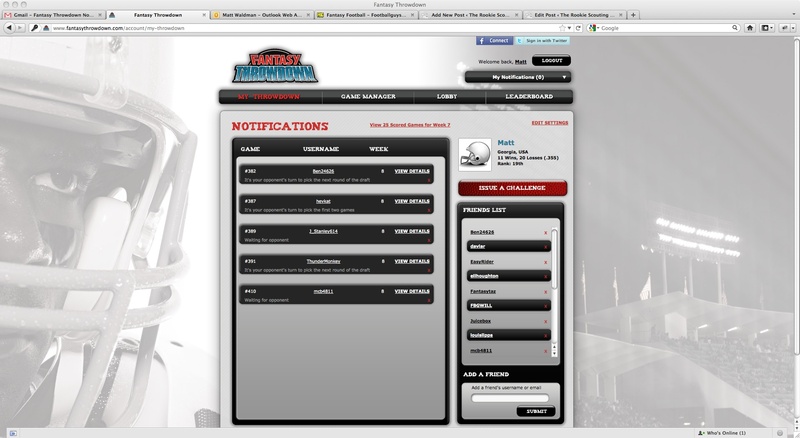 The draft room displays the summary of the challenges lineup requirements, scoring rules, and players each team has to pick. Note the check box that allows you to receive email notifications of each pick. You can also chat with your friends (Rt). Players are sortable by team and position. It’s a very intuitive and easy way to draft. The site is still in testing (BETA) mode, but we’ve had hundreds of drafts without a problem. Go to the site and create a login, accept (or create) a public challenge, or send me a private challenge by using my email: thegutcheck@gmail.com. Send me any feedback about the game as well. “Throw down” with me and let’s see what you got.